Happy Bloggers Challenge Friday! Thanks to those who played along with the Color Challenge, the challenge this week is Alter It. I apologize for the poor quality photo, hopefully the weather will be better tomorrow so I can replace the photo. I used an ornament black and gold embossed the star from Our Daily Bread Designs His Birth stamp set. Starting to look a lot like Christmas. 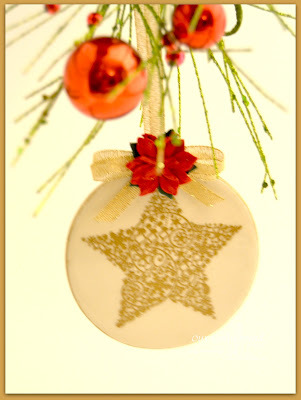 Awesome idea for the challenge a xmas ornament. Love it.